I saw this cute video and had to share it with you, my children couldnt believe it maasha Allaah may Allaah bless him. Forgive me there is a little music in the beginning so please mute your speakers for the first few seconds. 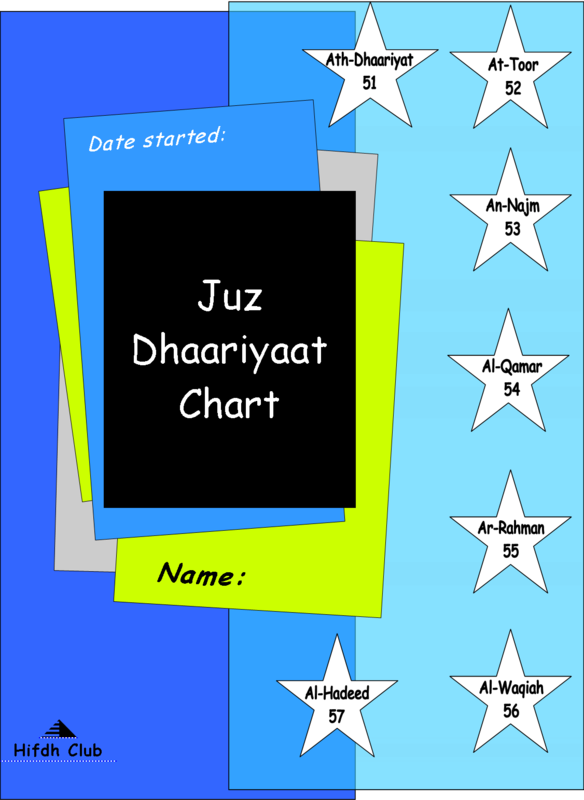 I just made some new charts to help monitor progress for Juz Dhariyaat. As you can see my design themes are pretty basic. If you’d like to use them but maybe a different colour just send me a message and I’ll change them for you in-shaa Allaah. today was the official start after Eid. Everyone had recovered (somewhat) from all the late nights of Ramadhan and early morning and parties of Eid and was ready to work again. I was a little worried that they would have forgotten some ayaat over the holiday period so as tired as I still was, we couldn’t delay any longer. I sat with the children to read Al-Hashr. I asked my daughter to close her eyes and read as much as she could so I would know where to start hifdh from. Then she read…..and read…. and read…until maasha Allaah to my surprise she got to the end. We all cheered and made dua for her with hugs and kisses all round. Her brother asked her “how did you know the end like that?” and she replied “I don’t know, I just knew it”. I was really happy as it seemed that playing the tapes of the surahs in their room had worked alhamdulillaah. Heres a lovely documentary, “Qur’an by Heart” about children from around the world taking part in the annual Cairo International Holy Qur’an Competition. Its for children that have memorised the entire Qur’aan. They’re sat in front of a special computer that selects a random portion which they then must recite (with correct tajweed) before a group of scholars from Al-Azhar and an audience. It follows three Muslim youths — Nabiollah from Tajikistan, Rifdha from the Maldives, and Djamil from Senegal — as they enter into an annual Koran-reciting competition in Cairo, Egypt. The competition attracts hundreds of Muslims from all over the world, many of whom don’t speak Arabic, but are able to recite the entire 600-page Koran — and beautifully. we’re celebrating as the children finished juz Tabaarak today alhamdulillaah and started Juz qad Sami Allaahu akbar!